What should be taken into account when exporting a large MySQL database? Except taking a lot of time export and import of a MySQL database implies transferring a large amount of data between client and server. The most effective way of reducing the amount of data transferred through the net and the amount of the used disk space is compression. All points mentioned above are taken into account in the utility for making database backups included in the set of tools available in dbForge Studio for MySQL. The rest of the article is written referring to this utility. Using compression for a connection allows to reduce net traffic owing to strings compression. The Use Compression option is available on the Advanced page of the Database Connection Properties dialog. But if the amount of string data per record is not large, you won’t gain much this way. In the Database Explorer tree choose the nod of the needed database or connection. 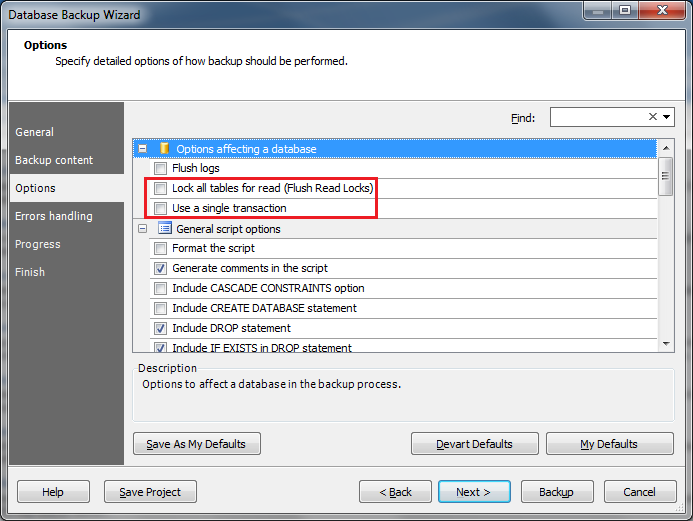 Choose Backup Database from the pop-up menu. On the image below we show the main settings of MySQL backup. Pay your attention to the fact that we are using compression to reduce the disk space usage. Besides using compression allows to add comments to the backup. After performing all necessary settings press the Backup button and wait until the application finishes export. 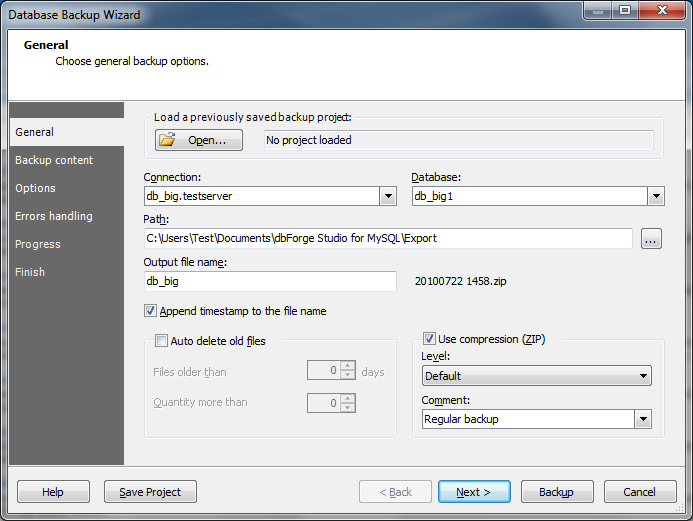 During the operation you will be able to see the progress of backup creation and its stages. The program finds the *.sql file in the archive automatically and shows the comment we’ve added when creating the backup. Now we are ready to import our MySQL database. After pressing the Restore button the program will automatically restore the database from the backup. 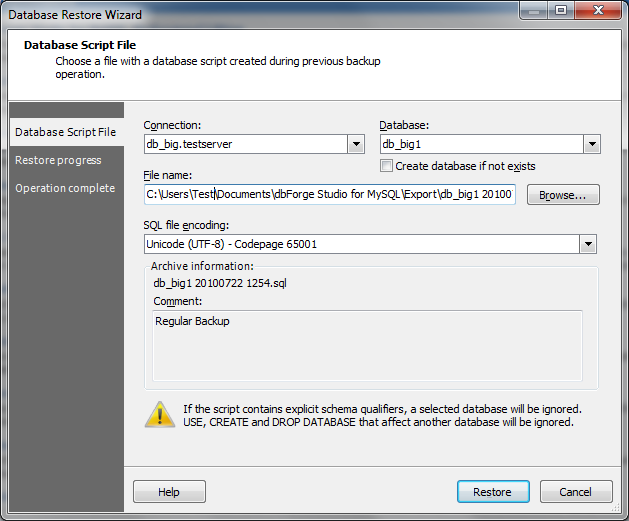 In this article we’ve reviewed some aspects of making backups of MySQL databases and illustrated capabilities of dbForge Studio for MySQL regarding export/import. You can download dbForge Studio for MySQL here. Importing / Exporting large MySQL databases can’t be done at all with mysqldump because it is too slow – especially for restore. This is why any significant sized system needs to do something else – typically either volume snapshots, rsync, filesystem dump from replication slaves, etc. What you’re suggesting simply isn’t practical with a multi-Tb database server. I agree with you that in case when you need a regular backup for multi-terabyte database it is faster to suspend MySQL server and dump file system. Because our product is more developer-oriented than DBA-oriented, article merely talks about making development snapshots (i.e. exports). And there are cases when database developer simply is not allowed to accomplish all operations you described. So he must wait for export to complete.